THERE IS A new product floating around which promises to tune your guitar automatically. All you have to do is program it, plug it in, put the winder on the tuner, and let it go to work. First of all, it costs $100, plus shipping and handling, plus I'm sure you can get an upgrade on the warranty for just a few bucks more. But wait! There's more! You also get a free set of Gizmo Cutting Knives! Secondly, by the time you hook it all up and figure it all out, you could already tune 10 guitars. And lastly, the human ear doesn't lie. I'm all about using technology to make music. I have a Boss digital recording studio which is a blast to use. Second String Music has Boss floor tuners for noisy stages. We have guitar amps that make huge sounds and replace half stacks. We have beautiful Dean, Luna, Takamine and Breedlove acoustic guitars with tuners built into them. I have a Bose L1 sound system for acoustic gigs. But whatever happened to tuning by ear? Probably went the way of telephone land lines. 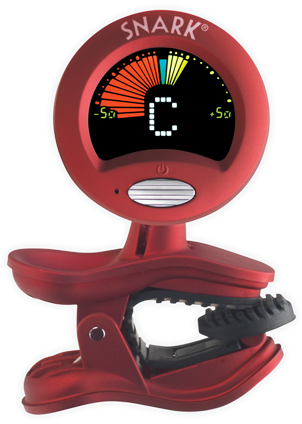 I use a Snark tuner most of the time. It costs 85 percent less than the Gizmo Tuner of Doom. You clip it on the end of your guitar and it's easy to use. It takes less than 30 seconds to lock in your tuning. You have to pay attention and know your notes to use it. And we have them here at Second String Music, which means you are supporting a small local business, not some dubious online operation. I'm always getting in tune with the straight and narrow at Fifth and Maine. Swing on by and I'll play you a tune, in tune, and show you how easy it is. We can show you to tune by ear, as well. And that's sweet music to our ears!